Home » Facebook for Business » Are Facebook Likes Your Perception of Social Influence Metric? Are Facebook Likes Your Perception of Social Influence Metric? Is getting Facebook Likes one of your social media marketing goals? (UPDATED: Sept 17, 2014) There are many ways to measure marketing efforts on Facebook. Getting Facebook “Likes” is just one of them. For those whose goal is to increase Facebook page “Likes,” you might not know this but the stats that says “x like this” of your Facebook page comes from personal profiles that liked your page, not “Likes” from other Facebook Business Pages. I signed in as Your Social Success and visited Chef Ivan Flowers’ page. It is showing that Your Social Success “Liked” Chef Ivan’s page. That only tells me that I have liked their page. That “Like” from Your Social Success isn’t included in Chef Ivan Flowers‘ number of “Likes.” As of this writing, they have a total of 470 likes from people NOT pages. 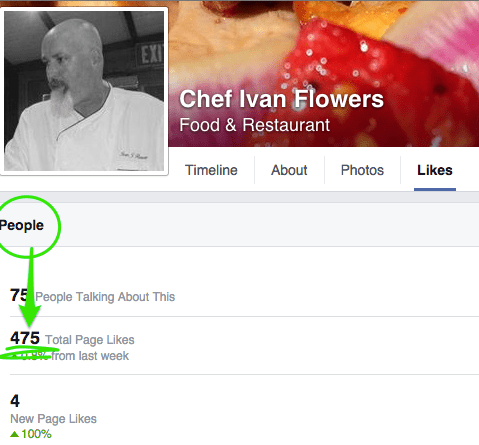 This section of Chef Ivan Flower’s Page shows you where Facebook is pulling the “Likes.”. Again it’s from People NOT Pages. It is also the same number of “Likes” that shows up when searching for them on Facebook. Don’t you wish that Facebook would count Pages too? Yeah, I know. That’s on my “Dear Facebook” notes. What is your main metric when it comes to your business’ perception of influence? Do you focus on growing your likes or engagement? Whatever it is, align your tactical strategies to one and be great at it especially if you are a small business with limited resources to spare. You can’t be great at everything when you have too many social media marketing goals that you are trying to focus and work on. If you are trying to grow your social media engagement, I wrote an article on doing social engagement on Facebook the right way. Posting almost every hour and being on the social media platform all day aren’t engagement the way Facebook looks at things using their algorithm. What are you measuring on Facebook? Your turn!